In the second week of April in 2006 I held a competition billed as "The Telepresent Tug of War". This event featured two large steel cages each containing a two-ton winch. Linking the devices across eight blocks of downtown San Jose was a bit of Python code comparing strength data about the participants. The game worked in a similar fashion to a traditional tug-of-war. You pull the rope, I move forward. From this competition I found emergent pockets of team pride, a bit of show-boating and alot of enthusiasm to be a part of the game. Below is an excerpt from my research documentation of the project. I discuss the cultural history of the tug of war, from its origins in China and Japan, to the more recent competitions held in Okinawa and San Francisco. It also examines competitions of pride, especially the duel. The final segment discusses the cultural significance of sport, especially within American society, to answer questions about its influence on art. 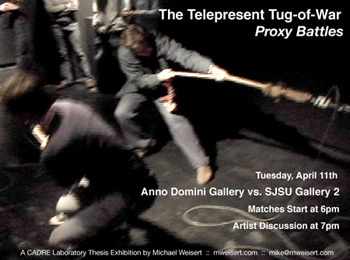 "The Telepresent Tug of War" will be shown again at ISEA2006/Zero-One San Jose this summer at Works Gallery in San Jose. As a means of conflict resolution, the duel carries a long history throughout Europe, America, and California in particular. The duel is separate from simple violent means of conflict resolution in that it contains a specific set of rules that participants must adhere to. . In 1777 the Irish created an excellent example of published rules of engagement, known as the Code Duello. This document covers the legal and honorable ways in which two men may settle their dispute. The origin of the duel began in A.D. 501 when Gundebald, King of the Burgundians, legally established the duel as a means of legal trial. (Baldick, 12). The belief was that to solve legal conflict, the two parties involved would engage in a strict form of combat. The victor was granted victory by God, which proved the validity of their argument. The tools for this combat have been varied, but usually involved swords. For those deemed unable to defend their honor (women, priests and men older than 60), they could hire a “champion” to represent them. This practice or hiring a proxy became common for those of greater means, especially those of royalty. It is arguable that the “champion” model set in place 1500 years ago is still existent in the form of hired attorneys. The most interesting aspect of the duel model of ancient times is that the actual defendant and/or plantiff would wait for the outcome of the battle with a rope tied to his or her neck. If their champion was defeated, they were immediately hanged as punishment. (Baldick) It is this idea of energy and consequence being transferred that is central to my work, the Telepresent Tug of War (TToW). In both methods, energy is being enacted. In the duel model, one champion defeats another with force. This information is passed through an intermediary and enacted on a separate entity. In the TToW, an individuel overcomes the perceived force of their opponent. This information is sent through an electronic intermediary (TCP/IP) and enacted out in the separate location. In the (American) West, especially California, the duel was a primary means of conflict resolution and entertainment. In the 1850’s, San Francisco became known as the dueling capital of the U.S. Local papers would advertise duels as street and stage performances for local residents to attend. It is arguable that these duels of honor were the first performance artists in California (apart from the original, displaced natives). One duel in particular utilized a primitive form of news updates to create a comparison between the two participants. This story relates to the Telepresent Tug of War in that the messenger in this story is acting in the same manner as the TCP/IP line in the artwork. He is delivering packets of information to Mrs. Gwin, who is able to assess the situation from a distance. In the TToW, two monitors located next to each unit stream the comparative data to observers on the contest. 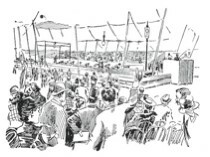 San Francisco was the scene of an altogether different display of dueling in 1894. Billed as “the greatest international tug-of-war tournament ever held in this or any other country”, the tournament hosted teams from eight different countries (U.S., Canada, Scotland, Germany, Italy, Sweden, Denmark, and Russia.) To measure the distance pulled by a particular side, the judge was raised above the ring and slid a ball down a rail to measure the distance the rope had traveled. This method was an excellent analog solution to the problem of force measurement (The TToW utilizes devices known as “load cells” to solve the same issue, which will be covered in the final section of this document.) More than 10,000 people filled the pavilion to watch Canada leave with victory. The popularity of the event led to the adoption of the tug-of-war into the Olympics in 1900. It was finally dropped from competition in 1920. In other areas of Japan and China, large-scale matches are held for different reasons. 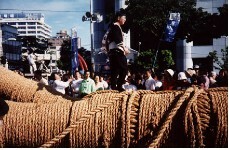 The Itoman Tsunahiki (tug-or-war) is held as a ritual to ensure proper crop growth. Legend holds that the first Tsunahiki held in the rice paddies was successful in clearing out insects, and has therefore been performed every year since in the month of June. In China, the sport dates back to the year 71 c.e. in which the tug-or-war was used as a means of settling a dispute over the superiority of Taoism vs. Buddhism. Many other areas of these two countries hold Tsunahiki as ritual relating to each area’s personal history. This use of sport as ritual and cultural event will be explored in the next section. I would first like to briefly touch upon the legend of John Henry and its reflection of cultural importance within American Society. The story of John Henry is a tale about a man who overcomes a machine in an industrial race. In the process, he dies from exhaustion immediately after defeating his mechanical foe. I want to briefly touch upon John Henry to bring to discuss the American tale of man vs. machine. In American culture we see an abundance of reoccurring stories in which the machine is an enemy to be feared. These stretch from the tale of John Henry, to movies such as Metropolis and The Matrix. The story of John Henry offers a possible explanation for this fear. During the industrialization of America, many people were displaced from their traditional job roles. The machine had effectively destroyed the jobs of much of rural America. This destruction was illustrated in the novels The Grapes of Wrath as well as Upton Sinclair’s The Jungle. By overcoming a machine, a cause of the Great Depression turmoil, makes John Henry the hero. When using the Telepresent Tug of War, users are physically struggling with a machine that is loud and powerful. With the users in different locations, all a participant can experience is this battle with a winch. At what point does the user separate the physical experience with the mechanical and the data driven from another human participant? The acceptance of the device as a bridge between two players relates directly to the nature of sports in general. “Sport, as a popular art form, is not just self-expression but is deeply and necessarily a means of interplay within an entire culture.” (McLuhan pg. 241) Sport and art are both a reflection of society that allows the participant(s) to act out societal beliefs without endangering the social fabric. The tragic hero, like John Henry, is found within both art and sport. 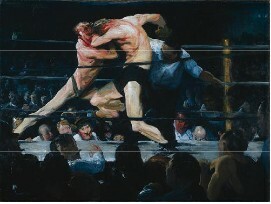 George Bellows created paintings depicting the acts of boxers in an ideological light. Examples of tragic figures in art include Jackson Pollock, Mark Rothko and Jean-Michel Basquiat. Each of these painters rises from poverty and obscurity to become famous, only to destroyed by a tragic flaw. Sports figures are no different. American culture idolizes tragic athletes such as Shoeless Joe Jackson, Pete Rose, Mike Tyson, and more recently, Barry Bonds. Beyond the tragic character, art and sport also share a rich history within religion in western culture. Art, especially through the Renaissance, was closely tied to Catholic theology in its subject matter. Ancient Greece and Rome used sport as public performance as well as a cultural system to build class hierarchy. It is this tie to ancient Rome, namely paganism that led early Catholics to demonize sport. This belief still carries on today in American society in which it is a societal belief that athletes sacrifice intellect for physical prowess. (sport pg. 91) Eastern culture holds an exact opposite view of sports. The focus on harnessing life force through body to promote spiritual growth is central to most eastern religions. I am most interested by the embodiment of a theology into athletics and art. When countries meet in the Olympics it becomes small battles of theology enacted through game. Great examples include: the 1933 games in Berlin, in which the United States faced off with Hitler’s “supermen”, the 1973 games in which the Russians defeated the United States in Basketball, and the 1980 games in which the U.S. Hockey team defeated Russia. In art, cultural battles have taken place in the early 1900’s when the United States worked desperately to shift the cultural focus from Paris to New York, or the more recent push of Asian / Pacific Rim culture to overcome an Atlantic-based art world. By focusing attention on a particular location, participants justify their beliefs and build a sense of national pride. This rule applies both sport and art. I began this section by singling out three sports: baseball, boxing and soccer. I selected these each one represents society at a national, regional and individuel level. Baseball is mostly considered an American sport, although which America (North or Central) I am referring to is debatable. The recent World Baseball Classic has brought this title into question. Baseball dissects America into regional rivalries in which similar regional locations battle for ideological superiority. The most obvious of these are: San Francisco vs. Los Angeles, Oakland vs. Anaheim, Cleveland vs. Chicago, and New York vs. Boston. Soccer, as opposed to baseball, is played widely on a national stage. During the first exhibition of the TToW, it was widely suggested that a Telepresent game was an excellent alternative to warfare. This argument is debatable when we consider the World Cup “Soccer War”. In 1969, El Salvador invaded Honduras after three hotly contested matches. Soccer has also been responsible for diplomatic strains between several African countries. In the beginning of the Iraq war, we learned the plight of the Iraqi soccer team. After their previous defeats, they were subject to torture by the Hussein family. On an individuel level, boxing has played the metaphor for the common man in both English and American society. America has rallied behind boxers such as Mohammed Ali, Sonny Liston, and James Braddock (as depicted in the recent film, Cinderella Man.) The boxer is easily compared to the “champion” of the duel as I previously discussed. The modern day boxer is an ideological champion for the common man. One lesser-known boxer, Tom Molineaux (a slave in 1810), was granted his freedom when his owner was in awe of his abilities. Tom went on to represent the United States in a fight versus Great Britain’s Tom Cribb. Molineaux was able to overcome racism due to his physical abilities in a sport central to American ideology. Throughout the history of art, different movements in art have made it central to their ideals to embody the values of their specific region. In American art, these movements included the Ash Can School, the American Landscape Painters and Regionalism, while all modernist art movements have specifically been created to promote a set a set of values. Baldick, Robert, “The Duel: A History of Dueling” Clarkson N. Potter, Inc. New York, New York. 1965 212 pgs. Goldberg, Ken (Ed.) “The Robot in the Garden: Telerobotics and Telepistemology in the Age of the Internet”. The MIT Press, Cambridge, MA. 2000 365pgs. JapanUpdate.com. The Story of a Rope – The Naha Tsunahiki. http://japanupdate.com/en/?id=6562# (accessed March 1, 2006). Lozano-Hemmer, Rafael. Selected Projects and Videos. http://www.lozano-hemmer.com/eproyecto.html (accessed March 10, 2006). McLuhan, Marshall, “Understanding Media: The Extensions of Man” McGraw-Hill, New York, NY. 1964 365pgs. Okinawa.com. Yoisho! – Naha Tsunahiki. http://www.okinawa.com/tsunahiki.html (accessed February 15, 2006). Packer, Randall and Jordan, Ken (ed. ), “Multi-Media: from Wagner to virtual reality” W.W. Norton & Company, Inc., New York, New York. 2001 394pgs. Paul, Christiane, “Digital Art”, Thames & Hudson, New York, New York. 2003 224pgs. Shaw, Jeffrey. /Works/Writings/Biograp. http://www.jeffrey-shaw.net/html_main/frameset-works.php3 (accessed March 10, 2006). STELARC. 2005. The Body. http://switch.sjsu.edu/v19/00001u (accessed April 1, 2006). Womack, Mari, “Sport as Symbol: images of the athlete in art, literature and song” McFarland & Company, Inc. Jefferson, NC. 2003 241 pgs.